Thanks to the rise in the sharing economy and the overwhelming success of platforms like Airbnb to compete with major accommodation providers, more and more travelers are opting for vacation rentals over hotels. As a vacation rental host, that’s good news for you! That being said, guest reviews can absolutely make or break your gig as a host. Unlike huge hotels that can afford a poor review here and there but still maintain an overall positive appearance and successful business venture, every “ding” in your listing presentation can cost you dearly. You can certainly try to make things right after a negative review, but you can’t ever erase it. The internet deals in ink, not pencil, y’all. 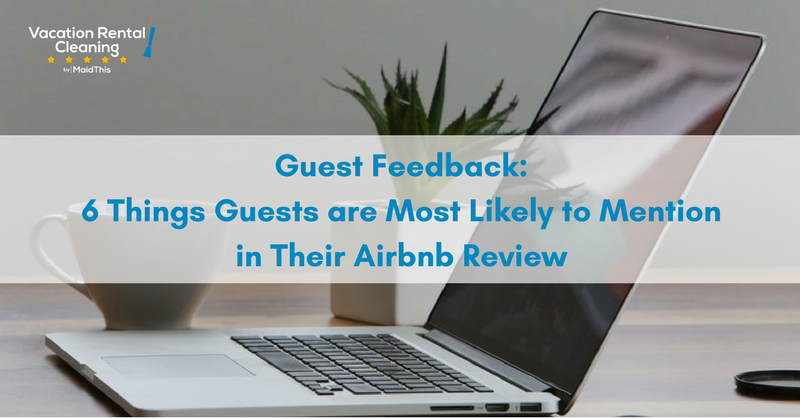 To avoid missteps and stay ahead of the negative review curve, here are 6 things guests are most likely to mention in their Airbnb reviews. Pictures say a thousand words, don’t they? And let’s be real: You can make anything look stunning with the right lighting, angles, and a killer photographer. You should definitely go out of your way to get fantastic images of your space but make sure they truly reflect what your guests will see when they show up. Pictures can also be deceiving and if your guests arrive expecting one thing but find something totally different, they’ll make mention of it. Investing in a professional photographer to get high-quality pictures of your place can increase your booking volume, meaning that it’ll pay for itself in time! On the other hand, if your images deliver true “snapshots” of your vacation rental, you’re sure to get a rave review. Whether your guests are traveling for work or pleasure, they’re going to want internet access. That’s just a given. It’s helpful if you’re able to offer it the “old fashioned” way via an ethernet connection – which is always a safe bet over wireless – but wifi is still king. Smartphones and tablets can’t connect to the internet without it and if you’re not able to offer a strong signal, you risk scaring potential guests away. We recommend going as far as listing your actual WiFi speed in your booking profile…this will also help attract business travelers who want a place with great WiFi. If your guests are staying for more than a week, it’s not a bad idea to cater to them with some additional perks beyond offering a discounted rent rate. Offer up extra services like a weekly or bi-weekly house cleaning so they’re not the ones scrubbing the bathroom during their stay. Offer to change out their linens every couple of weeks with fresh ones so they don’t need to do their own bedclothes laundry or wash their own towels. You might even go so far as to send over a gift every once in a while as a “thank you” for staying with you. Consider a bottle of wine, a fun snack like Shari’s Berries, or a gift card to a nice local restaurant for a night out on the town. We know guests move things around and your cleaning crew likely does their best to ensure everything is put back in the same place after every turnover cleaning, but somehow, things can still go missing. That said, if your guests can’t find something, the blame doesn’t fall on other guests or the cleaners; it falls on you. If you list that you’ve got a hair dryer, ask your turnover contractors to check for it every time and return it to its home. If you promise an iron and ironing board, make sure they’re there. Where are the keys to the locked trash disposal area? If you’re not 100% sure of your stuff’s exact location every time a new guest checks in, you’re risking sabotaging your good hosting name. We recommend creating a guest folder or digital information “book” with information on where everything is so guests can find it themselves. Look, we know – and your guests know – that some things will be out of your control. You can’t tell your neighbors what to do or control how far away your place is from the nearest light rail station. You can, however, be honest. If your neighborhood isn’t quiet, don’t say it’s quiet! Instead, market your place as a party-friendly rental. If your place isn’t near public transit or close to many businesses, don’t claim things are “within walking distance.” Instead, offer a guaranteed place to park a car on the street, in the garage (if you have one) or in a nearby parking lot. This could look like a lot of different things and it’s up to you to put a positive spin on the negative. Sit down and make a list of every possible “bad” thing about your vacation rental. Then consider what alternatives you can offer your guests. Rather than highlighting the flaws, overcome them ahead of time by presenting solid solutions. That way, there won’t be anything to complain about. Depending on how involved you are personally with your vacation rental, this may prove to be challenging for you to amend. If you’re juggling a full-time job and hosting is your side hustle, you may not have much wiggle room to accommodate guests’ ever-changing desires. Despite the difficulty, guests aren’t thinking in terms of how their needs affect your life; they’re thinking about how they affect their vacation. How restrictive are your check-in hours? If you have to (or prefer to) physically meet your guests when they arrive, are you available at late or odd hours? Can you offer your guests a place to leave their luggage if they need to check-in early or if they don’t leave town immediately after their check-out? How much work are you asking of your guests at check-out? Is it more than a few simple, one-minute tasks? How easy is it for guests to return keys? Catering to your guests’ needs and desires is a big job and, ultimately, will be what keeps you consistently booked and highly ranked in search results. By being fully aware of what your guests will expect and how they think about their overall experience, you can prepare ahead of time and stave off negative Airbnb reviews before they even happen. You can hire a professional check-in/-out service company like Check-In LA to help out. Interested in offering your long-term renters a complimentary cleaning service or need help automating your turnover process? Take a look at how MaidThis! helps vacation rental hosts.